Presented here in an exclusive 4K restoration with a wealth of extras, Fulci’s gore-drenched classic can now be devoured as never before! WOE BE UNTO HIM WHO OPENS ONE OF THE SEVEN GATEWAYS TO HELL, BECAUSE THROUGH THAT GATEWAY, EVIL WILL INVADE THE WORLD! From the Italian godfather of gore, Lucio Fulci, comes City of the Living Dead, a notoriously nauseating, compellingly corporeal masterpiece of apocalyptic zombie horror! Stridently going beyond the classical stylings of his horror hit Zombie Flesh Eaters, City of the Living Dead sees Fulci eschew conventional narrative logic in favour of a delirious, oneiric mode of storytelling which stresses style, surrealism and atmosphere (as well as offering up bucket-loads of brains, blood and guts!) Presented here in an exclusive 4K restoration with a wealth of extras, Fulci’s gore-drenched classic can now be devoured as never before! Have you seen this one domino? I thought I had, but I can't find any record of me having seen it in my viewing logs, so I guess not. All those Fulcis that aren't Zombi run together for me in my mind, but I could have sworn I saw all of the "big" Fulci movies-- maybe I'm just remembering it from one of those trailer compilations? I remember that cover art on that poster from a VHS catalogue my dad had when I was like five or so. I very much wanted to see it but alas could not. I imagine it's the usual Fulci film? Nonsensical and incoherent yet somehow very watchable? domino harvey wrote: I thought I had, but I can't find any record of me having seen it in my viewing logs, so I guess not. All those Fulcis that aren't Zombi run together for me in my mind, but I could have sworn I saw all of the "big" Fulci movies-- maybe I'm just remembering it from one of those trailer compilations? It’s a mash up of The Beyond and Zombie, so really you have seen it. Though I like it more than those two (and House by the Cemetery), it shares all of their flaws and does little to improve on their small set of good points. It is the kind of film that has the effect of drilling itself into your memory once you have seen it! colinr0380 wrote: It is the kind of film that has the effect of drilling itself into your memory once you have seen it! You must’ve gotten your sense of humour at the same place as my dad. Very cruel and surreal - including deliberate non-sequitur dialogue - with much spatial disorientation and I’d argue its case as a genuine artistic achievement. I do think it had a bit of an influence on James Herbert's The Ghosts of Sleath. Yes. I think it was a bit better, certainly on a wider scale, than Haunted (and definitely had a few gory setpieces, which is probably why Orlac made that great connection! Although I would suggest maybe the structure of hapless newcomer to a quaint small town with dark secrets means Ghosts of Sleath is City of the Living Dead meets Hot Fuzz?) but still has one of the more unlucky (especially in love) main protagonists of all of James Herbert's books. And James Herbert wrote The Jonah! Its actually a loose trilogy featuring the character of David Ash, comprising 1988's Haunted (which was made into a film directed by Lewis Gilbert in 1995), The Ghosts of Sleath from 1994 and Herbert's final book, Ash, from 2012. My memory of Ghosts is that it has a character getting a similar treatment to John Morghen in City, but it has been at least five years since I encountered either. I guess that you mean that early scene in the book in which a character suspected of molesting a child gets his head bashed in with a mallet in the middle of the village green by the girl's father, before his assailant gets a planing tool and "began to plane away the skin and bone from _____'s face" in front of an either ironic or blackly comic (Either way unfortunately timed!) busload of curious schoolchildren! Yes, that's the one. Doesn't sound that much like City now I think about it! 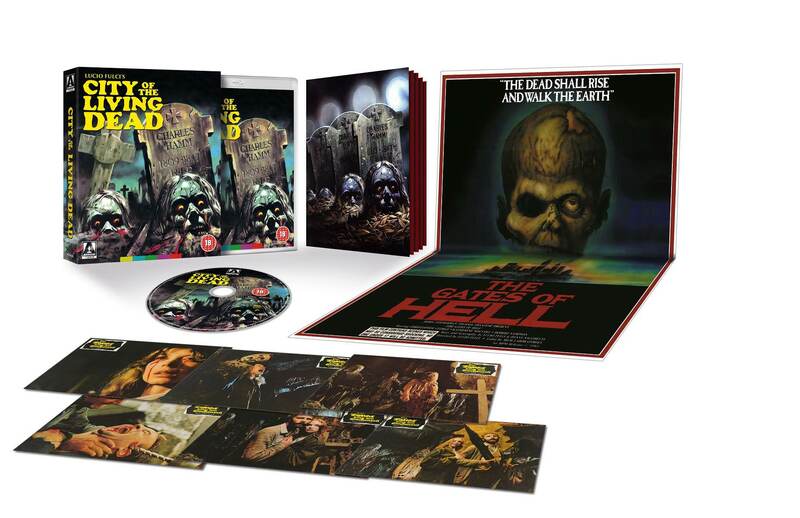 Finally a superb Blu ray release of COTLD. Not the most aesthetic of Fulci’s horrors, and of course feels cheap and rushed, yet the cold blues of MacColl’s coffin, and the Thomas family crypt, look appropriately icy. Far better grain than the old (hugely flawed) Arrow release. This is a proper restoration job, I’d argue. Although Fulci’s roughest film from his peak of zombie mayhem, this is still genuinely - and absolutely deliberately, I will argue all night - disruptive in terms of time, space and also cause and effect. That, combined with its sickening gore scenes, contribute to making a genuine work of surrealism.